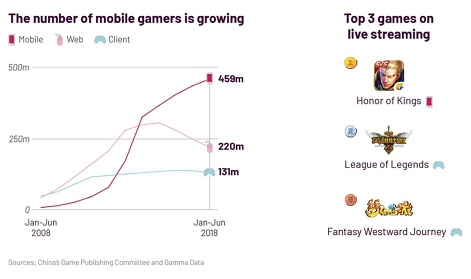 A report by China’s Game Publishing Committee and Gamma Data has found that a third of the Chinese population plays mobile games. With 459 million people, the audience for mobile games in China is as high as the population of Japan and the United States combined. China-centric tech outlet Abacus provided a handy breakdown of the report. Mobile games rose to 60 per cent of the total market’s $15.4 billion revenue earned in the first half of 2018. “Client” games (PC and Console releases) kept relatively static at around 30 per cent, while browser games fell to 6.9 per cent. Tencent’s Honor of Kings is China’s most popular game, taking No.1 in the top 10 list of highest-grossing Chinese games within the country in 2018. That list is dominated by both Tencent and NetEase, with 5 games apiece in the ranking. It’s not all blue skies for China’s games market in 2018, however. The year has been marred by a months-long block on new game releases after a government restructuring. While that suspension may be coming to a close, there’s likely to be a host of new changes coming. Tencent has already been pushed towards tougher restrictions on younger Honor of Kings players. The publishing giant saw a $20 billion drop in value following the block - but Tencent has the money to burn. Smaller developers may not have been so lucky.